So if you support a new interpretation of the 14th, then you are open to and accept (if not supporting) that the 2nd and any other amendment, may be interpreted differently in the future. Definitely. Can't see the issue. But many have stated you can't debate the 2nd amendment. I realize this is the two opposing sides: The people in favor of "jurisdiction" being interpreted differently in the 14th are likely (though not all) to not believe that including "well regulated" as part of the 2nd is not appropriate. And the same but opposite goes for the other side too. But here is the fact: If you advocate for "reinterpreting" then you must support it, as your appear to understand, for all amendments and can't arguing against that. You can argue for your position, but not against being open to an changed interpretation. You're making the error of basing your argument around both interpretations of the Amendments having been fully debated. The 2nd Amendment has been debated by the court many times. The basic right has been upheld. Some restrictions to the rights spoken by the Amendment have been allowed to stand. The beginning of the 14th is apples to oranges. Illegal alien birthright citizenship has not been decided in court. There is currently no restriction to the Citizenship Clause either. 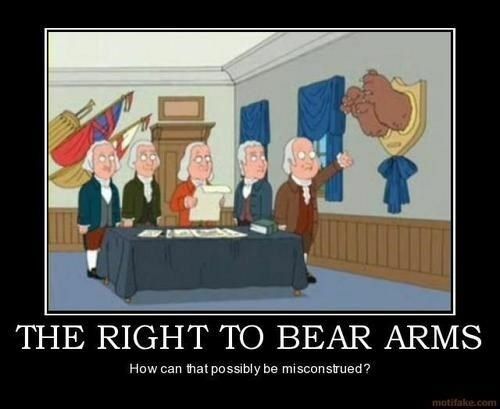 Originalist interpretations have defended the 2nd the right to bear arms. A consistent originalist interpretation would probably leave the the Citizenship Clause on shaky ground for illegal aliens. Illegal alien wasn't a term when the Amendment was adopted (similarly to how weapons have advanced to unforeseen levels, many of which are banned). The original intent didn't cover that term. Ruling that illegal aliens aren't eligible for birth citizenship isn't a changing of an interpretation. It would be an establishment of one. Those staunchly defending illegal aliens birth citizenship are on shaky ground regarding consistency in arguments. It's a political flip-flop. You can't have it both ways. Originalist interpretations have used the full wording of the 2nd amendment, only the recent Heller ruling decided to not follow the original intent. You are ignoring 200 years of interpretations and stating that only the most recent Heller decision can apply? You do realize it is fully open to change and should (in my opinion) and likely will going forward due to the preponderance of precedent with the earlier rulings allowing restrictions and understanding and accepting the full 2nd amendment wording. I'm honestly on the fence on this one. I like the spirit of our current interpretation of birthright citizenship. But what I don't like is those who choose to abuse it by coming here to have a baby and then returning to their home. Admittedly that is quite a small amount of people; but that's still probably not in our best interest. I think there's an easy solution to that though, which would be similar to another country listed earlier. That could include residency requirements after birth, or perhaps you just don't allow BC to people who are here on tourism visas? I thought the rule was: "We don't need more or to change laws, rather we need to enforce the laws that we have." The last president was a Constitutional scholar and Republicans freaked the eff out. We now have a man who only knows how to golf and eat Big Macs and Republicans are suddenly experts on the Constitution. Republicans said nothing when Chinese, Russians, Polish, Irish, Somalis, Germans, Saudis, Melania, were using the 14th Amendment and "birthright citizenship" and "chain migration" but, whooo boy! Spanish speaking people? Let's change the Constitution! Precedent was established in US v Wong Kim Ark in one of the early challenges to this provision in the 14th Amendment. He was a child born in the US to Chinese nationals, all of whom went to China while Wong Kim Ark was young. He returned as a teenager to work, but following a visit to China, was denied entry into the US. The case was thought by those against this provision that the Supreme Court would rule against Wong Kim Ark, and that it would more narrowly define who would be eligible for citizenship at birth. The court found in favor of Wong Kim Ark in a 6-2 decision based purely on the interpretation of the text in the constitution. 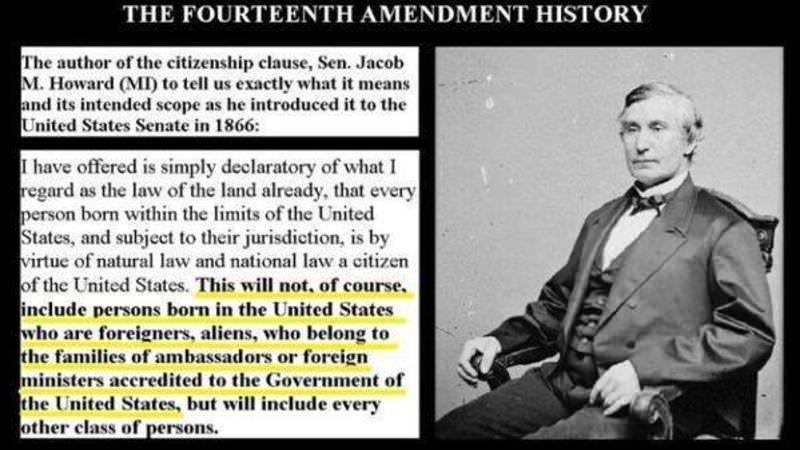 The 14th amendment does not make the distinction between children born to foreign citizens on American soil (jus soli) and those born on US soil inheriting citizenship from a parent by another country (jus sanguinis). Dissenters argue the latter — that a child born on US soil takes the citizenship of the birth parents — but given the lack of clarification in the text itself, the former must be assumed, and has been affirmed by precedent. It has withstood multiple legal challenges since the Wong Kim Ark decision in 1898. The writings of the man that wrote the provision aren't relevant; what is relevant in strict constitutional law is what exists in the text. Just as a reminder, the late conservative Justice Scalia was an originalist and textualist in every sense of the terms, and he would not have interpreted the 14th amendment any differently than the set precedent. It is highly unlikely that that most of the conservative justices currently on the bench would interpret it differently. Regardless of individual sentiment, the issue will only be changed through a constitutional amendment. An EO would be up against more than a century of precedent. Wong Kim Ark, who was born in San Francisco in 1873, to Chinese parents who were legally domiciled and resident there at the time and not employed by the Chinese government, had been denied re-entry to the United States after a trip abroad, under a law restricting Chinese immigration and prohibiting immigrants from China from becoming naturalized U.S. citizens." Your precedent covers a child born to legal, permanent US residents who, under the existing law, were not allowed to become US citizens. The issue came up because the child left the country and was subsequently denied reentry. I haven't seen Trump's E.O. but I suspect that it will cover illegal aliens coming to the US for the purpose of birthing US citizens. It may also deal with women coming to the US on legal visas. I agree with others who say that testing the 14th amendment in court is not a bad idea. Trump's E.O. will certainly get the attention of the federal courts but will go up the chain as if it was a law? Such a law won't get past the Dems in the US Senate. I suspect Trump sees an E.O. as the simplest, quickest way to get a SCOTUS review. The "jurisdiction" clause was meant to exclude diplomats. Diplomats are under the jurisdiction of their home governments and are generally immune from the jurisdiction of the state in which they are posted (with some limits and exceptions, of course). They can be expelled, but they are generally immune to criminal prosecution. Undocumented immigrants are not immune to jurisdiction of the state in which they are located. the meaning of the 14th Amendment would ultimately be clarified by SCOTUS. Unless the Roberts Court wants to reverse past precedent, this is already a settled matter. The SCOTUS already ruled on the matter that a parent's status has nothing to do with whether a child born in US jurisdiction receives US citizenship. It would be interesting if the GOP wants the court to change its definition: they would admit that the Constitution is not static in time and adapts to present day situations...which means opposition and outrage to the Obergefell ruling is hypocritical of them. If an executive order, and a legislated and signed law have the same weight in federal courts then Doc's right. Could the higher courts simply toss an E.O. because it's not an actual law? What precedent do you have that settles this matter, US v Wong Kim Ark? I can't imagine adapting the constitution to present day situations. Which present day would you like: today, 30 years ago, 60, 90, how about 30 years from now? What a mess that would be! It's the oldest, best constitution in the world so lets keep it that way. The President probably cannot write an Order that contradicts laws. But on matters where the law is unclear, or it delegates authorities to him, he can write commands to various people to do things, like any chief executive can. He can't order you or me around, but he can order the EPA or the Dept of Agriculture around, within his authority. This is "rules making." Where laws may be unclear, the executive can write clear procedures or goals that the government must follow. Edit: well, actually a bunch of stuff the government does TO US (like precise IRS tax procedures) are basically done on presidential authority. There was a news article that Trump may change how capital gains is calculated, if I recall correctly. They will allow you to use inflation-adjusted cost basis, when paying capital gains tax. This would result in lower taxes. If rule making is found to be illegal or unconstitutional, or laws found to be unconstitutional, then a court can quash them. The existing precedent simply challenged the validity of citizenship to an individual born to foreign parents, without clarifying the specific circumstances you mentioned. Therefore, it is precedent irrespective of those details. The 14th amendment lacks clarification in itself, and because of that, one cannot make interpretations based on text that does not exist. First of all, specifying "that it will cover illegal aliens coming to the US for the purpose of birthing US citizens" requires an unrealistic burden of proof in the absence of hard evidence. It is often very difficult to prove intent in a legal setting. Even if that clarification were supported by the Constitution, it would be an extremely ineffective provision. I agree that birth tourism is a major issue, at the very least because it's an abuse of the intentions of the 14th amendment — albeit that is neither specified nor supported by the text in the Constitution. It is well documented that thousands of Chinese women specifically come to the US each year to give birth, then return to China with a child maintaining US citizenship. This is either to give future opportunities to that child, or to give the parents a "safety net" to attain US residency in the future. However, that could likely be remedied with a change in the visa requirements for entry into the United States. Many counties around the world have restrictions for pregnant women, and often deny entry or visas for a period that extends near or beyond the end of pregnancy. Fixing that issue would likely receive some bipartisan support, and likely have support from the majority of Americans. It wouldn't require a Constitutional amendment, and likely wouldn't even require an act of Congress. However, the issue at hand seems to be geared more towards limiting the ability for children of undocumented individuals to attain US citizenship under any circumstance, which defeats the purpose of the 14th amendment, both as it is written and (in my opinion) in spirit. Simply because the birth parents are in the country illegally doesn't disqualify the child from receiving citizenship as the Constitution is written, and the text itself clearly does not make that distinction. Any clarification on that point would require an amendment to the Constitution, and since it's unlikely that two-thirds of both houses of Congress will ever be able to agree on anything, this likely isn't a viable option. I agree with others who say that testing the 14th amendment in court is not a bad idea. As we both know, US v Wong Kim Ark tested the 14th amendment, and that created the precedent that currently exists. Case law does not necessitate precedent being tested again when the circumstances are unchanged. An EO is intended to define policy, not to clarify the constitution. This would be an extreme misapplication of an Executive Order. Executive Orders are required to be supported by the Constitution — this has been held by the Supreme Court, and this instance would certainly not differ. As EOs are laid out in the Constitution in Article II, Section I, it can't grant EOs the power to change itself. That just doesn't make any sense. An EO that clarified or directly conflicted with the Constitution would not be supported by the Constitution, and would therefore be unconstitutional. It would make for a rather quick SCOTUS review. Furthermore, this isn't the type of issue SCOTUS would relish the opportunity to define; they would rule based on existing case law, and force Congress to act instead. But this is all a moot point, because I don't believe an EO will ever happen. It's just more midterm cannon fodder. As an aside, something that I find rather amusing in the current situation is the apparent flexibility of some conservatives when it comes to interpreting the Constitution. I seem to recall it being quite popular during the Obama years for many Republicans in Congress to carry a pocket Constitution with them, along with frequently mentioning that the actual text written in the Constitution is the law of the land. But now, it seems that some are willing to toss out that textualist belief to suit their political agenda. It doesn't exactly look good when someone tries to have things both ways. I give credit to Paul Ryan for consistently being a textualist regardless of its political convenience. No matter what craziness that would be proposed in a Convention.... 38 states would still have to vote yes or no to approve what was written, without the possibility making changes to what was written. How do you know that the Jurisdiction clause was solely meant to exclude diplomats? I don't see it in the constitution. In fact the only place I've seen it recorded is in Directflight's post #6 where it's listed with foreigners and aliens. If it's good enough for ambassadors and foreign ministers, why not include foreigners and aliens? I think we're getting subjects mixed up. As a verb, everyone in the US is subject to arrest if they break the law. If I go to Nicaragua, I am subject to Nicaraguan laws and can be arrested if I break them. As a noun I am a US subject. As such, I express a desire to work and live in the US, have official government recognition and ID, and have rights, protections and privileges that others don't. When British subjects visit the US they are subject to, and expected to obey, US laws. If they don't they can be arrested. Diplomats are certainly subject to US laws but they are not US subjects. They can be arrested but have immunity from prosecution. Not picking on the Brits here, I've just heard the term 'British subject' many times. Also, an arrest in the US can be something as simple as a police officer talking to you about J-walking or littering (be polite and don't run). I suspect that Trump is considering the following. The link gives an example of a Chinese husband and wife who were lawful, permanent residents of the US, which made them US subjects. An existing US - China treaty precluded them from becoming citizens, but because they were US subjects, their child was born a US citizen. A Mexican citizen illegally entering the US is subject to US laws but remains a Mexican subject. A child subsequently born to that Mexican becomes a Mexican subject but is subject to US laws while in the US. Executive Orders are considered the law of the land, provided they are supported by the Constitution. Courts exist to decide on the constitutionality of law, whether it come from the legislative branch or the executive. No law from either branch is immune from this test, which is how checks and balances work. Provided an EO is supported by the Constitution, it holds the power of law. The key difference between an EO and a law passed by Congress and signed by the president is that the latter cannot be undone without a subsequent act of Congress. The former can be undone by Congress or a future president through another EO. This is why EOs are not a satisfactory method of attempting to solve important issues. The President probably cannot write an Order that contradicts laws. The president cannot write an EO that contradicts the Constitution, nor with laws enacted by Congress. However, it can define the enforcement of laws enacted by Congress, as enforcement is a component of the executive branch. Many other facets and limitations of EOs are not clearly defined by the Constitution itself, which is why ambiguity exists. Wikipedia was your link, not mine. My link was to the Library of Congress, which contains more detailed and accurate information on the case. You're arguing the concept of jus sanguinis, which was specifically rejected in the Wong Kim Ark case. This was the viewpoint of the two dissenting judges. Thanks for the quick response atc. My first question in my first post on this subject concerned the weight the courts would give to an E.O. vs federal law, which you've just answered. I suspect that Trump will issue an E.O. to define his policy based on his understanding who is a subject of which country, then just kick it to the courts. If you're right, and I have no reason to doubt you, the first judge that sees it will toss it in the garbage and no other will pick it up. Amazing...so much action on migrants, even changing the constitution. But only thoughts and prayers for shooting victims while hugging the constitution. Go back and turn your old English classes on and then read it again and you'll see that's what it says. There is no "or" in his statement. It was fashionable in those days for statesmen to be unnecessarily verbose. He is talking about people who are foreign diplomats. The problem with people who want to re-try this amendment is that they imagine an "or" in that statement that isn't actually there. Now, as I've said, I'm open to an honest debate about ending just soli, but then we need to have a firm discussion about all of the different possibilities and circumstances of a birth and ensure that we have a fair and uniform policy that is unambiguous. Once we do, then we can move forward with a constitutional amendment. The President is not a king. Trump is doing the right thing here. Some one could be born here, have their citizenship. Go back to god knows where, and become a dangerous terrorist and come back and be a threat to our country legally. This is a matter of national security and Trump once again has the courage to stand up to the left and stop this. Trump is a true blessing from our Lord! For those of you who are willing to sit back and let this golfer in chief be king and wipe out Constitutional Amendments (laws) with just the swipe of a pen, you WILL be cheering when a Democrat does the exact same thing with the Second Amendment. Or when this guy does the exact same thing with the First Amendment. It takes an amazing level of reality rejection to make that statement. For that I commend you. DC vs. Heller was a case study in originalism. That it was interpreted a certain way is the issue you have. Even with that landmark ruling, the 2nd is heavily restricted. What's the issue with regulating this part of the 14th to restrict a right that has been abused by foreigners? Because when it comes down to it, we all know this is the real issue. This isn't about if an EO is Constitutional or not. If this was a law proposal, new arguments would be drummed up against it. This is about trying to protect unlawful residents. Aliens first. It could be argued that those who came here under visas that have since expired or even those who "hopped the fence" and began having children here and are working, the 14th Amendment would apply to them. Originally, the 14th Amendment was for slaves. It could be argued these are modern day slaves. Again, we need to ask about Melania and anchor baby Barron and all the Russians who stay in Florida to give birth. Would they be excluded? I am of course fine with jus solis, if you are born here then you are conferred with a US citizenship. And I support this not because of, what to me is a flame bait and unneeded statement, "Aliens first" or "Protect unlawful residents" but because it has greatly benefited our nation over years and we still benefit from it. Last edited by Tugger on Mon Nov 05, 2018 9:57 pm, edited 1 time in total. Birth tourism issue can be easily addressed by asking China to enforce no dual citizenship law. If I understand correctly, parents hide the baby's US Citizenship and get Chinese citizenship as soon as they land back in China, which is illegal under Chinese law. Share the data with Chinese, they will fix it for you. BTW, when is the EO signing ceremony? He has to do it by tomorrow morning. I certainly would not put a sovereignty issue under the control of another nation. I know what you are getting at, the problem is solved if enforced elsewhere but I just don't like the concept. Rather than creating a constitutional crisis or prolonged legal battle which very unlikely to prevail, this is an easy fix. I don't have the DoS link but by law, any American citizen expressing an intent to become a citizen of another country loses American citizenship. American born babies have that option until their 18th birthday. By taking Chinese citizenship babies legally lost American citizenship. Just the status need to be reconciled. While I think that's the way it should be dual citizenship is very common. Look at all the Israeli / Americans there are. Section 101(a)(22) of the Immigration and Nationality Act (INA) states that “the term ‘national of the United States’ means (A) a citizen of the United States, or (B) a person who, though not a citizen of the United States, owes permanent allegiance to the United States.” Therefore, U.S. citizens are also U.S. nationals. Non-citizen nationality status refers only individuals who were born either in American Samoa or on Swains Island to parents who are not citizens of the United States. The concept of dual nationality means that a person is a national of two countries at the same time. Each country has its own nationality laws based on its own policy. Persons may have dual nationality by automatic operation of different laws rather than by choice. For example, a child born in a foreign country to U.S. national parents may be both a U.S. national and a national of the country of birth. Or, an individual having one nationality at birth may naturalize at a later date in another country and become a dual national. U.S. law does not mention dual nationality or require a person to choose one nationality or another. A U.S. citizen may naturalize in a foreign state without any risk to his or her U.S. citizenship. However, persons who acquire a foreign nationality after age 18 by applying for it may relinquish their U.S. nationality if they wish to do so. In order to relinquish U.S. nationality by virtue of naturalization as a citizen of a foreign state, the law requires that the person must apply for the foreign nationality voluntarily and with the intention to relinquish U.S. nationality. Intent may be shown by the person’s statements and conduct. Read the text carefully, a foreign citizen can obtain American citizenship and become a dual citizen if the other country allows dual, like Israel. If the foreign country doesn't allow dual citizenship you have to renounce foreign citizenship like with India and China. An American citizen by birth cannot do the same without relinquishing his/her American citizenship. It is a one-way street. I don't think dual citizenship should be allowed. Or, how about the hospital shares birth information with the parent's embassy? Or INS simply denies entry to pregnant women? It is not just China, BTW. Birth tourism is very popular among Russians. No, the base has appealed to the President. He listens to the people. Other Presidents didn't have a problem because they are globalists that don't want our laws to be followed. They want the slow fracturing of a nationalist USA. Trump puts America first.. Translation, Trump is going to protect us from all the scary little brown people who don't speak American and/or pray to the wrong imaginary friend. Congratulations by the way for falling for one of the oldest tricks in the book. All this is is a bigot blowing a dog whistle for all the other bigots out there. Because if it were a bunch of Norwegians showing up at border Trump and all his buddies would be filling out the citizenship paper work themselves. Trump has said as much. our roads and bridges are falling apart, not the reason why our kids are doing active shoter drills in school, not the reason for a seemingly endless war in the middle east. You see these issues are a whole lot more important than birthright citizenship/ immigration. However there are people in positions of power that don't want you to think about those issues so they find something to distract you with. And if you think that does not happen then you are naive. Didn't know about Russians, Thanks. Any estimate of how many each year by country? There are no solid statistics, even how many babies are born to foreign nationals in total is a guesstimate, 36k/year or less, which makes it less that 1% of all US birth. So single nationalities probably drown in noise. Legal foreign nationals make up ~4% or so of the population within US borders, that would make birth tourism seem a rather fringe thing. but by law, any American citizen expressing an intent to become a citizen of another country loses American citizenship. American born babies have that option until their 18th birthday. And that is not true. They are not applying "for the foreign nationality voluntarily and with the intention to relinquish U.S. nationality." They were born as both. You will not "lose" you US citizenship by being a US born dual citizen. Or they could just leave the baby in the US with relatives. As for losing ones US citizenship, I remember reading that plenty of people found it quite difficult, when they do it to escape the taxman. My sister is in a civil union with a French guy whose father is Hawaiian so he has US citizenship too (not by virtue of the 14th amendment, although he was also born there). He's still a student and has never filed anything with the IRS, I fear that one day they'll get into trouble over this. So, as with the migrant caravan, it is a distraction. Probably to gin up the base. After all, we are talking about Republicans excluding those from south of the border. I’ve always thought it was a dumb idea to be given citizenship in a country just because you are born there, especially if neither of your parents are citizens. With the initial basic tenet of US creation that was intrinsic. Land of the Free. Free is contagious.